Yes, hundreds. I know, there are literally hundreds of birds in the ABA region and the Western Palearctic too and recent major Big Years have nabbed well over 700 species in the ABA. That said, not even 300 of those were identified in an area around the same size as Costa Rica. Similar in size to West Virginia, thanks to a bunch of different major habitats, rain, and tropical biodiversity, it’s pretty easy to top 300 in a week or two, and even identify 500 over the course of three weeks. If you are new to the Neotropics, most will also be lifers. Oh yeah, and this small Central American country is also much closer than most people realize. Getting here is a quick two or three hour flight from hubs in the southern USA. Red-headed Barbet at the Cafe Colibri, Cinchona, Costa Rica. As if any of us birders are going to ignore feeders. 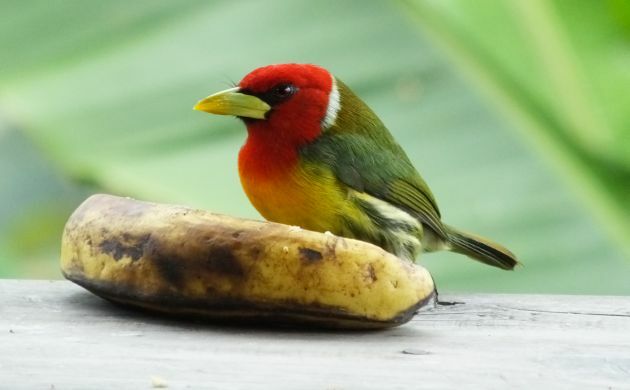 In Costa Rica, instead of seed feeders attended by chickadees, sparrows, and other small, hardy species, we have tanagers, woodpeckers, chachalacas, euphonias, saltators, toucans, and more that come to wooden platforms with papaya and other tropical fruits. Find some of the best feeders at Rancho Naturalista, Laguna del Lagarto, the Colibri Cafe, the Fortuna Nature Trail, Myriam’s Quetzals, Bosque Tolomuco, and Talari Mountain Lodge. As far as hummingbirds go, there are pretty good feeders for Violet Sabrewings, mountain-gems, Fiery-throateds, and everything in between at various sites. 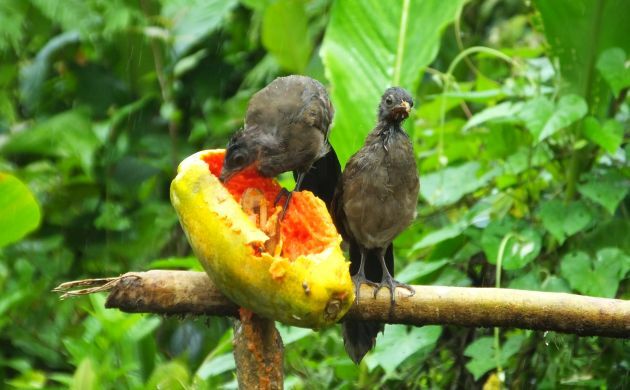 Baby Gray-headed Cachalacas get dino-crazy with a papaya at the Fortuna Nature Trail. 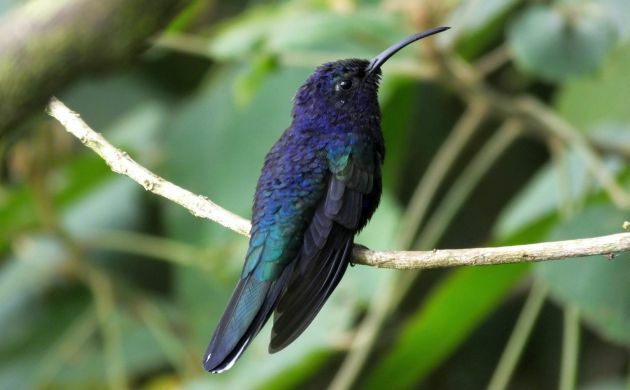 This big purple hummingbird is a Violet Sabrewing- common in Costa Rica. Yes, there are hundreds of birds in that field guide including smart-looking little manakins, crazy cotingas, and pages of raptors but their presence on paper doesn’t mean that we are going to see all of them. Raptors are naturally scarce and most require forest rather than open areas, forest species tend to be shy and automatically adept at staying out of sight, and it can be a literal pain to focus on tiny birds moving through bromeliads way up there in the rainforest canopy. Be patient, bird with an experienced guide, and study the field guide before hand to be ready for some crazy tropical bird action, especially during frantic mixed flocks. Know that although it’s easier to see birds in second growth, more species occur in large areas of primary forest, and seeing more species in such forest habitats is a function of time correlated with patience and the presence of an experienced guide. The office hours of the parks aren’t birder friendly but you can still get lucky with an antswarm and see stuff in the forest after eight a.m., and if you ask the guards a day before, they will often let you in early the following day. The interior of the rainforest is typically quiet and full of trees. Given all that apparent awesome habitat, we can’t help but wonder where the heck all those birds are (! )….until we come across an awesome mixed flock where wrens rustle the vegetation, woodcreepers climb up tree trunks, Lesser Greenlets act like warblers, and tanagers race through the foliage. Or, we might get super lucky and come across an antswarm attended by tinamous, antbirds, antpittas, and a forest-falcon. Or, birds might materialize in the form of stealthy quail-doves, shy nightingale-thrushes, and other avian surprises. Suffice to say, for many of the coolest birds, you have to spend a fair deal of time beneath the shade of big, old-growth trees. The good thing is that even when you aren’t seeing birds, it’s always a good day when you can walk through the green cathedral of a primary rainforest. The fear of flycatchers and woodcreepers is a temporary affliction that can occur after a quick glance in a new field guide. Instead of a few similar birds, there are dozens! How are we going to deal with that confusing array of potential lifers, especially when we can look at pretty birds with more obvious field marks? Before we let the paranoia take over, buck up and take a closer look at the field guide. All of those birds can be identified with the right look, or associating the species with range and habitat, it just takes a close, patient view accompanied by brave jumps to a definitive identification. 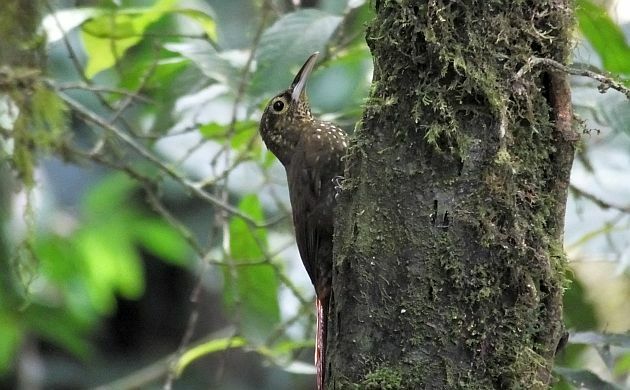 Be not afraid of this Spotted Woodcreeper. This is on the road between Cinchona and Sarapiqui, check the hotspot in eBird. It’s scenic, and it’s a great spot to stop and scan the canyon for White Hawk. If one or a pair aren’t being obvious by soaring around, look for a bright white spot in the greenery on the other side. 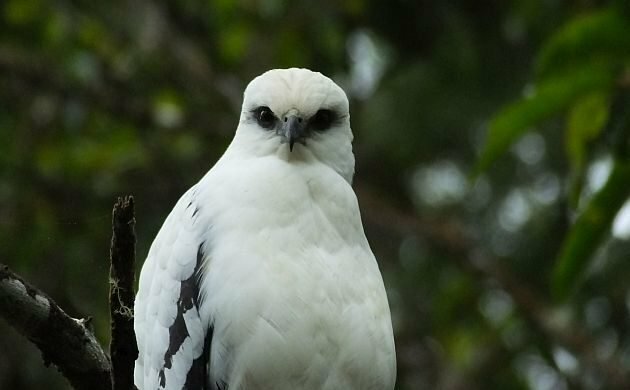 Scope it and chances are, it will transform into a perched White Hawk. In the meantime, check the snags for Bat Falcon and watch for soaring Barred Hawk, Short-tailed Hawk, Broad-winged Hawk, and maybe a hawk-eagle. 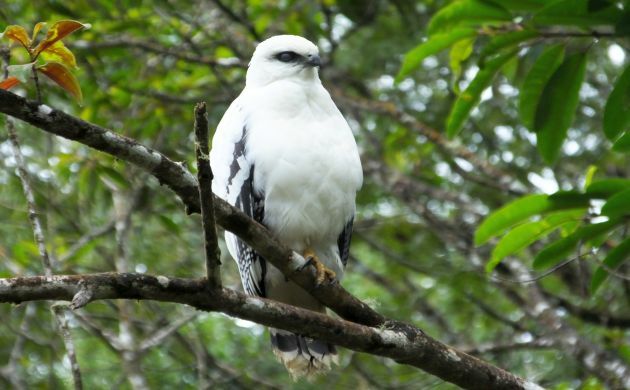 A White Hawk that was not on the other side of the canyon. I know, how could you not be anxious to see a toucan? What I really mean is that as long as you go birding in good rainforest habitat, you should see toucans and aracaris. In good habitat, these fancy birds aren’t that tough to see, and visit feeders in some places. The one avian outlier is the Yellow-eared Toucanet. Seeing this shy, pretty uncommon species is a question of patience and luck in quality foothill and middle elevation forest. 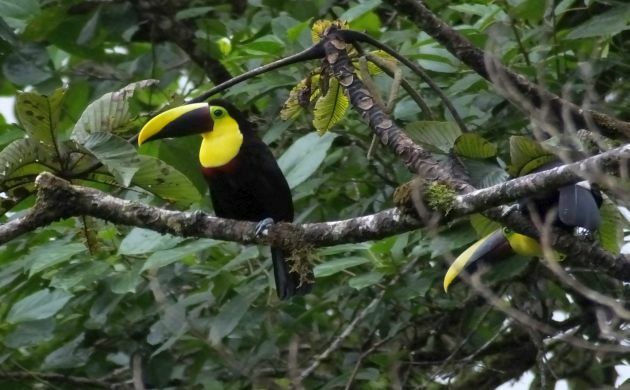 There are actually two Yellow-throated Toucans in this picture. Wishing all birders who come to Costa Rica in 2017 the best of luck, hope to meet you while watching an antswarm! That’s nice , I think we all should go to this place. The place and timings are nice and the birds are exquisite. The varieties at this place is immense and if you ask me then we should look forward to going there, feed the birds of every kind and add this to our memory.